On Wednesday, October 8, Butler Library’s open stacks will become both hunting grounds and laboratory. That day we are pleased to welcome Andrew Stauffer, Professor of English at the University of Virginia, and the Book Traces project to Columbia. The Book Traces project is a crowd-sourced web project aimed at identifying unique copies of nineteenth- and early twentieth-century books on circulating library shelves. Professor Stauffer founded the project after years of sending students into the University of Virginia stacks to find personalized copies of books of Romantic and Victorian poetry. Andrew Stauffer describes the importance of the project very eloquently on the Book Traces website but I want to underscore his description of these books as constituting a massive, distributed archive of the history of reading, hidden in plain sight in the circulating collection. Viewed that way, they are a treasure. Historians of reading constantly face an evidence problem because it is difficult to find or follow past readers’ traces. However, not all post-industrial nineteenth century books look like treasure from the outside. They can be crumbly and fragile, riddled with what librarians call inherent vice. Faced with these volumes, some readers, and some library circulation managers, are happy for a rationale that justifies moving them offsite or online. There are many discoveries to made if you think to look, but we need to start looking before the evidence is moved out of sight or obliterated. What will we find on October 8th? When I went through the Butler stacks recently with librarian colleagues Jane Siegel and John Tofanelli, for the most part we found annotations and bookplates. Many flyleaves displayed the name of Nicholas Murray Butler, former Columbia University President (from 1902-1945) after whom the building is named. On many front endpapers we found the bookplate for the Paterno library, which is split between Columbia’s Casa Italiana and the Butler stacks. In this book from the Paterno collection above (Antonio Mirabelli’s Istituzioni de Eloquenza) you can see the traces of four separate handlers of the book: Aldo B., John Reynolds, Prof. F. Ettari, and finally the bookplate for the Paterno Library. 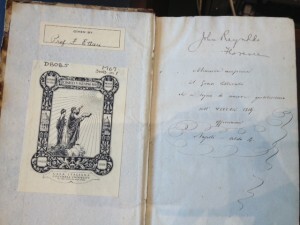 The first two inscriptions state Italian locations: Aldo B’s dedication in Italian notes “Napoli” and Reynolds adds after his name, “Florence.” Looking at these traces we can follow the book on its journey across the Atlantic and formal incorporation into the library at Casa Italiana. 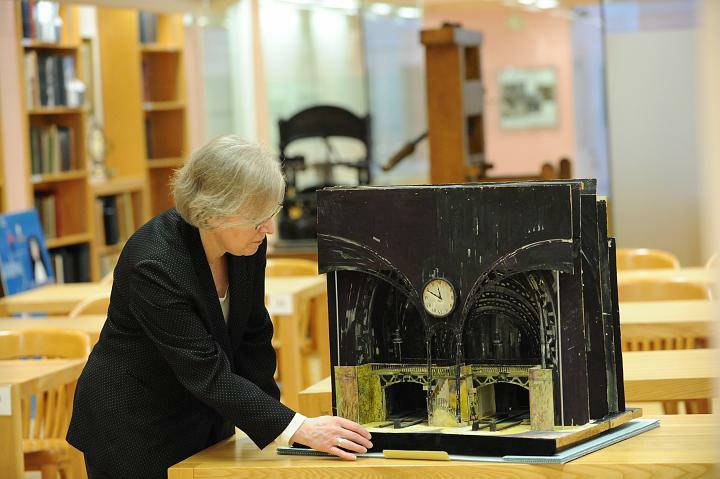 For me, they were a prompt to learn more about the Paterno collection, aided by Meredith Levin, Columbia’s Librarian for Western European History and Literature. The books in the Paterno Library arrived at Columbia through many channels but always under the auspices of Italian-American Charles V. Paterno, who made his fortune building “modern” (that is, elevator) apartment buildings around Morningside and Washington Heights. Paterno was determined to build a library of Italian culture in Columbia University’s Casa Italiana. As early as 1925 representatives of the Casa traveled to Italy on book-buying trips funded by Paterno; professors in the Italian Department ordered or donated others. Maybe Professor Ettari was one of them. We know that Butler and Paterno traveled together to Italy in 1928, where they were feted by Mussolini and given entrance to the Villa d’Este: a fascinating view on a moment in history, and for me a vista that opened up only when I opened this book. Inspired by Professor Stauffer’s example, instructors across the country are incorporating hunts in the stacks into their courses this fall, and asking students to upload their findings to the Book Traces website. Several Columbia professors have done the same and their students will be combing the Butler stacks on October 8th. The event is not just for students, but also open to the public and other members of the Columbia and Barnard communities. To participate RSVP to Karla Nielsen at kn2300@columbia.edu with Book Traces in the subject line and the time of the orientation you want to attend. On October 8th, Professor Stauffer will give introductory sessions to the day’s activities at 10:00am, noon, and 2:00pm in the Studio@Butler. There will be a wrap-up event in the Studio at 4:00pm on October 8th and a debriefing of the day at 6:00pm on October 28th as part of the Book History Colloquium at Columbia. If you are interested in annotated books, nineteenth and early twentieth-century literature or are curious about the project, the history of library collections, or how library views on the printed book are changing in the digital age–come on down! This entry was posted in Uncategorized on August 29, 2014 by Karla Nielsen.